You want to thrill to stay at the hotel with the concept of an old hotel skipper former home of batik in Solo, Central Java? Stay in "Hotel Roemahkoe Heritage" on the Road Laweyan, Solo. This hotel is the most appropriate place to commemorate the glory days of old. Because, this hotel was formerly the home skipper batik in Solo. If you go to the city of Solo, one of the activities that you will definitely want to do is shop batik. Batik is a wide range of styles and modes also exist along the road Laweyan. Entering the hotel lobby was beautiful with furniture typical Java architects settings. Flower pots of green leafy width very comfortable viewing. Doors and wall hangings all Javanese. The rooms are arranged opposite the fountain pond overgrown with flowers leaves a lot of elephants. In front of the room there is a terrace with tables and chairs. Travelers who stay here can feel comfortable when drinking coffee on the terrace while enjoying a fish pond with a fountain in the gutter it. The dining room is very exotic set of Java-style furniture first time. This room overlooks the set of gamelan. Travelers who stay can learn gamelan to gamelan teacher. Guests can also learn batik when staying at this hotel. Recreational events around Kampung Lawelayan can be done with a rickshaw ride in the front of the hotel are always ready. Been to the village batik teselip between high walls of white down the small alleys of two feet area. Being sensation could see the batik making process in factories batik makers. By maintaining a form of the building, Hotel Roemahku from the front is still seen as old-fashioned house with a beautiful terrace, a solid wall, and like-like a hotel lobby living room with ancient Javanese-style layout. 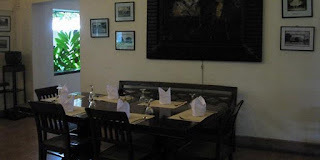 All the room began to lobby, dining room, living room, filled with old Javanese furniture. And arrangement of the walls with Javanese ornaments. But the hotel room was clean, neat, and in accordance with the standard five-star hotel. From this hotel is not far when tourists want to continue the tour to be with the Surakarta Kraton Kasunanan pedicab or horse cart. Klewer Market shopping center Solo batik are also nearby.